The agency is called SPARK EforAll Holyoke. It represents a merger of SPARK Holyoke, an entity created to inspire and mentor entrepreneurs, and EforAll, the Lowell-based organization that has created an effective model that does essentially the same thing. By whatever name it goes, the agency is helping to spur business ownership among minorities, women, and other constituencies, and it is already changing the landscape in the Paper City. That’s the name India Russell and Lamont Stuckey gave to a product that is now the main focus of a business they call Veganish Foodies. This is a company, but also a mindset and what the partners call a “lifestyle brand for anyone making the change to ‘healthy living.’” Elaborating, they told BusinessWest that veganish foodies are individuals who love food and are ready to explore the more-healthy vegan lifestyle one meal at a time by substituting their favorite foods with healthier alternatives or ingredients. The Everything Sauce? That’s part of it. It’s something they concocted themselves as a spicy alternative to other things people put on their food and something that may make the healthier foods in a vegetarian or vegan diet more, well, palatable. As noted, this sauce has become the main focus of this business venture since the partners became involved with a program called SPARK EforAll Holyoke, the latest branch office (if that’s the proper term) of an agency that started in the Lowell-Lawrence area of the state in 2011 and has expanded to a number of small and mid-sized cities, including Holyoke, that share common challenges and demographic profiles (more on that in a bit). Overall, EforAll, short for Entrepreneurship for All, is an agency that essentially promotes its chosen name, specifically in cities that have large ethnic populations but few resources for individuals with entrepreneurial energy and drive. Holyoke certainly fits that description, and EforAll became part of the landscape in the city when those managing the agency known as SPARK decided last year to merge with EforAll and fully embrace its model, said David Parker, CEO of the organization. Tessa Murphy-Romboletti, executive director EforAll, Alex Morse, was encouraged by the progress being made in her hometown, and wanted to play a bigger role in those efforts. Like the better-known Valley Venture Mentors, SPARK EforAll Holyoke features mentoring, accelerator programs, pitch contests, and other forms of programming to help participants take an idea and eventually transform it into a business — while also helping them avoid many of the mistakes that turn businesses into casualties, said Tessa Murphy-Romboletti, the agency’s executive director. But its work generally involves a different constituency. As for Russell and Stuckey, they became part of the accelerator class at SPARK EforAll Holyoke that graduated late last month during ceremonies at Wistariahust Museum, a fitting location because it was the home of William Skinner, one of Holyoke’s most noted and inspirational entrepreneurs. 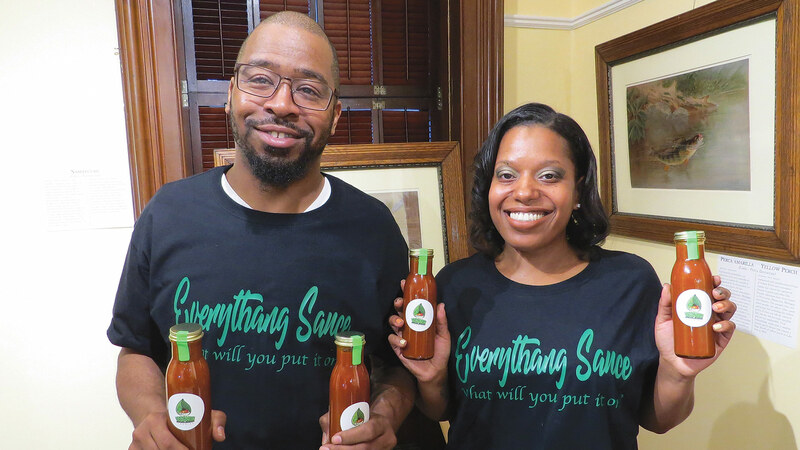 Their mentors helped persuade them that making Everything Sauce shouldn’t be one small aspect of their venture — it should be the main focus. 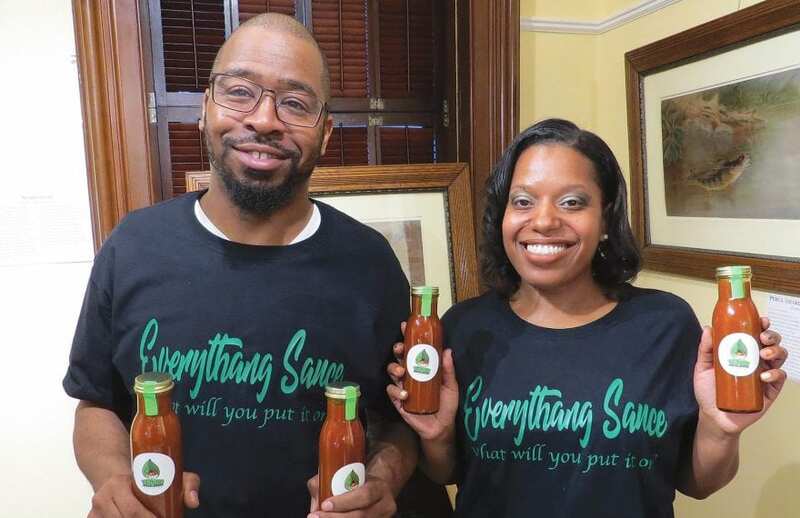 And they followed that advice, securing space in a commercial kitchen (Cornucopia Foods in Northampton) to scale up production, a process that is ongoing; you can now buy a bottle (price tag: $12) at Cornucopia or Crispy’s Wings-N-Fish in Springfield. “When we came to SPARK EforAll, they really helped us organize ourselves and focus more on our sauce,” Russell explained, adding that the partners had several products and services, ranging from a 40-day cleanse to a seven-day challenge, but their mentors narrowed the company’s focus to something scalable and something it could sell. In entrepreneurship circles, they call this a pivot, said Murphy-Romboletti, adding that such moves are usually vital to shaping a developing concept into a growing business. And there was a lot of pivoting going on with the latest accelerator class, she noted, adding that it included eight companies, four of which split $5,000 in prize money to help take their ventures to the next step. For this issue, BusinessWest talked with the entrepreneurs behind those prize-winning ventures to gain some perspective on SPARK Efor All and its growing impact within the region’s entrepreneurial infrastructure. Those companies came away from the ceremonies with one of those large ceremonial checks, but the reality is that they won much more than that — specifically a better road map for taking their business on the path to success. Alex Sandana told BusinessWest that he had aspirations to be a professional dancer while growing up. But his family was sternly tested by the expensive classes and training it would take to make that dream reality. So he can certainly relate to the young people he’s now giving lessons to in a studio on High Street in Holyoke he calls Star Dancers Unity. He opened it in 2013, and, like most people in business for any length of time, said his experience has been a roller-coaster ride — meaning both ups and downs. Alex Sandana with some of his students at Star Dancers Unity. Things have become somewhat less turbulent since he became involved with SPARK EforAll Holyoke, a step he wishes he had taken much sooner. “I got into this knowing … zero,” he recalled. 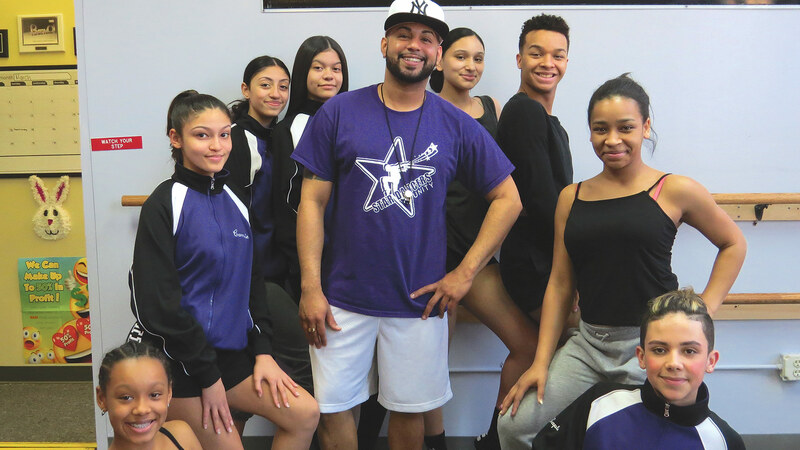 “I had an idea of what I was getting myself into, and I knew that Holyoke needed a place where kids could be themselves and not be burdened by the high tuition that other dance studios charge. But I never had any experience in business; I was learning as I was going. EforAll has helped him expand the portfolio, if you will, serving not just young people, but also providing lessons, and choreography, for weddings and quinceañeras, the fiestas staged for girls turning 15 — that Latin equivalent of the sweet-16 party. “I was able, with the help of my mentors, to identify other ways to generate revenue,” said Saldana, adding that this more-diversified business has much greater growth potential. Helping business owners execute such changes and key pivots is essentially the mission statement at SPARK EforAll Holyoke, said Murphy-Romboletti, 29, who worked for several years as the executive assistant, scheduler, and press secretary for Holyoke Mayor Alex Morse, who coaxed her into returning to her hometown after she relocated to Brooklyn, feeling, as many young people did and still do, that she had to leave this area to find what she was looking for. As she explained how she took the reins at the small agency, she said she watched as many of Morse’s initiatives in the broad realm of economic development — from promotion of the arts to development of an innovation district to programs to inspire and support entrepreneurship — began to change the landscape. And she decided she wanted to be part of it. One that led to another step when the directorship of SPARK came open. That provided an opportunity to work on a project she helped get off the ground while working in the mayor’s office. Those sentiments help explain why and how SPARK came to merge with EforAll. Holyoke’s demographics are similar to those in other cities it serves — 51% of its residents are Hispanic, and 9% of its businesses are owned by Latinos — and there is a need for services to help that latter number rise. Meanwhile, EforAll had an established model generating measurable results in other communities. Thus, she now leads what amounts to the latest in a series of expansion efforts for EforAll, which, after being launched in Lowell-Lawrence, has subsequently added offices in New Bedford, Fall River, Lynn, and Hyannis (an office that serves the entire Cape), as well as Holyoke. The business model for the agency — launched under UMass Lowell with initial funding from the Deshpande Foundation and known originally as the Merrimack Valley Sandbox — involves working in communities, and with individuals, who are generally underserved, at least when it comes to initiatives within the broad realm of entrepreneurship. There are a number of measures for success, he said, including the number of businesses launched (both for-profit and nonprofit in nature), jobs, sales, and the capital raised for those ventures, he went on, adding that there have been a number of success stories as well. The one cited most often is that of Danaris Mazara, who came to this country from the Dominican Republic at age 22. Parker, who has told the story often, said that, after her husband was laid off from his job and the family began to struggle, Mazara took food stamps her mother gave her to buy groceries and instead bought ingredients for flan, a popular Dominican dessert. She made enough to sell to her co-workers and friends and made $500 in a few weeks. Fast-forwarding a little, Parker said EforAll helped her move the flan operation out of her home and into a commercial bakery that she now owns by helping her secure a loan. It also assisted with product lines, pricing, and other aspects of the business. Today, she has 13 employees and is already looking for a larger bakery. The EforAll model itself is scalable, said Parker, adding that the agency is certainly in an expansion mode. Indeed, now that it has shown that its formula for bolstering a community’s entrepreneurial ecosystem works in several Bay State cities, EforAll is ready to embark on expansion into other areas of the country. “We hope to announce new EforAll programs in other states within this year,” he told BusinessWest, adding that the goal is to have another four sites by the end of this year, another six by the end of 2020, and perhaps as many as 50 in the years to come. Julie Molianny and Rashad Ali, who launched Cantina Curbside Grill, a food truck featuring Latin fusion items, aspire to open a brick-and-mortar restaurant in the future. Meanwhile, in Holyoke, SPARK EforAll is getting set to open co-working space in a building on High Street — the doors will likely open in May — and thus take its mission to a still-higher level. Funded by a MassDevelopment Collaborative Workspace grant, the 1,500-square-foot facility has a large room that can accommodate perhaps 20 desks and several smaller cubicle-like areas, said Murphy-Romboletti, adding that there is obvious need for such space in Holyoke, and she expects that it will be well-received. At the same time, the agency’s mentoring and accelerator programs are helping a number of entrepreneurs and aspiring entrepreneurs move their concepts forward. The 12 weeks of classes — two classes a week — are “intense,” Murphy-Romboletti, adding that each company is assigned a team of three mentors that act as an advisory panel. 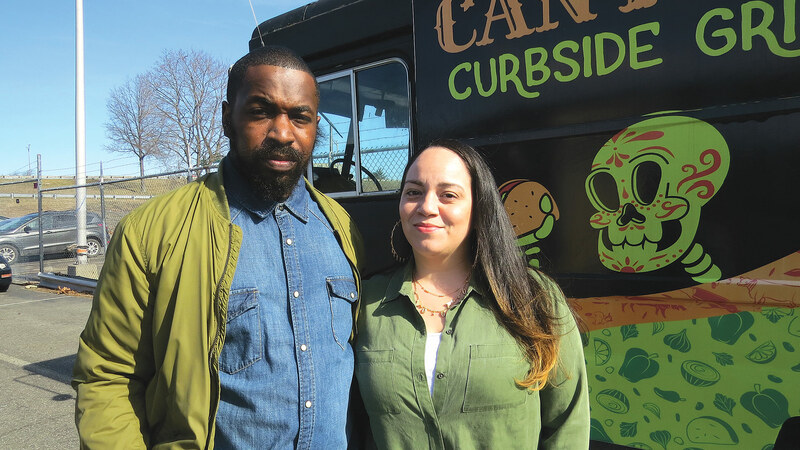 People like Julie Molianny and Rashad Ali, who launched Cantina Curbside Grill, a food truck featuring Latin fusion items such as tacos, burritos, quesadillas, and more. They started slowly in 2017, said Molianny, focusing on events on area college campuses and farmers’ markets. But the truck will soon shift into a higher gear, figuratively, she noted, adding that later this month it will be parked Monday through Friday at a still-to-be-determined location near Springfield’s riverfront. Down the road, and probably not far down, the partners want to add a trailer to the lineup so they can handle bigger events, she said, adding that the ultimate goal is to have a brick-and-mortar restaurant. EforAll has helped the two with the accounting and pricing sides of the ledger, said Ali, and also with focusing on not only the big picture — what’s in the business plan — but also myriad day-to-day issues involved with running a business. “The hardest part is keeping tabs on everything, crossing all the T’s and doting all the I’s, staying on top of taxes and everything else,” he said, adding that the accelerator classes have helped the partners stay focused and organized. Specifically, that means focused on the best options for stability and growth moving forward, which brings us back to Russell, Stuckey, and Everything Sauce, which is just one bullet point in their ever-changing business plan. Indeed, the partners also have plans to put a food truck on the road, one that would offer what they called “plant-based alternatives,” and operate what might be considered non-typical hours. In the meantime, they intend to scale up their sauce. They’ve moved from a few gallons at a time in their home to four or five gallons at Cornucopia, which they found with the help of SPARK EforAll, and aspire to production runs of perhaps 200 gallons or more, perhaps at the Western Mass. Food Processing Center in Greenfield, which they also found with help from their mentors. These mentors are entrepreneurs themselves, said Murphy-Romboletti, meaning they’ve been on the roller coaster themselves and have real-world experiences that translate into sage advice about if and how to take an idea from scratchings on a table napkin to Main Street, or High Street, as the case may be. From left, Marcos Mateo, his mother, Madeline, and Abiel Alvarado, look to open their auto-service business in June. That was the case with Abiel Alvarado, his girlfriend, Madeline Mateo, and her son, Marcos Mateo. The three are going into business together, in a venture called Mateo Auto Sales, which has an interesting backstory. Indeed, Alvarado was in the auto sales and service business in Puerto Rico, and essentially saw that business, and his life, turned upside down by Hurricane Maria. He relocated to Holyoke, where he met Madeline and expressed his desire to soon get back into business for himself. 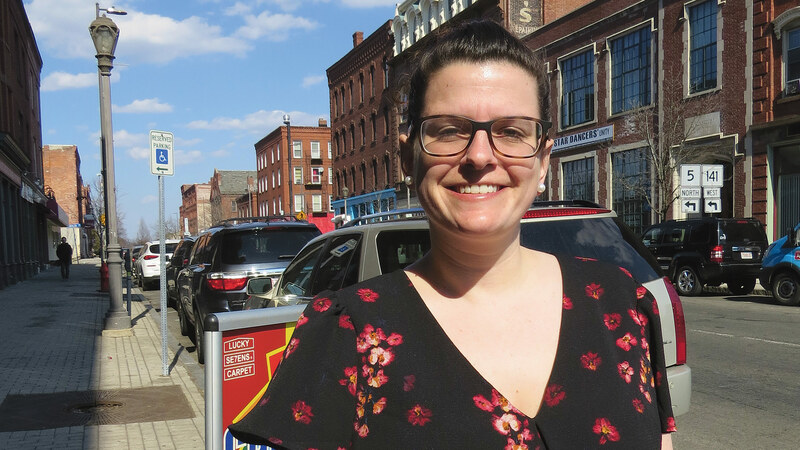 Looking for some help and direction, Madeline went to City Hall, and was soon redirected to the Chamber of Commerce and eventually SPARK EforAll Holyoke. The three partners applied to, and eventually became part of, the latest accelerator class. Marcos Mateo told BusinessWest they’ve received many different kinds of support for their mentors. “They provided a lot of guidance,” he said. “They lined everything up, they showed us exactly what we should be focusing on; our mentors helped us with identifying where to go and how to find information. Alvarado and the Mateos are currently in lease negotiations on a building, and hope to be open for business in June. After that, they’ll begin what will likely be a roller-coaster ride, something all entrepreneurs endure. With the accelerator behind them and quarterly meetings with their mentors to continue for at least the next year, maybe the ride won’t be particularly wild or feature many significant dips. Helping create a smoother ride is what SPARK EforAll Holyoke is all about. Its accelerator programs and other initiatives are unique when it comes to the constituency being served, but similar to others in that its mission is to open doors to business ownership and the opportunities it creates. And that’s why these services are pivotal, in every sense of that word. For years now, there have been rumblings from the world of higher education. Rumblings that times were changing and times were not particularly good. Rumblings that in some cases led to mergers among colleges, even a closing or two, and predictions that more were likely to come. But the rumblings seemed far away, involving small institutions most of us had never heard of — Mount Ida College, Newbury College, the College of St. Joseph. All of that changed last week, when Hampshire College President Miriam Nelson dropped what seemed like a bombshell, but what was in reality news that many saw coming. She announced that, amid falling enrollment and declining revenues, the nearly half-century-old college has commenced a search for a partner to help secure its future. The situation is so dire that school officials are not even sure if they’re going to admit a freshman class for this coming fall. That decision will come in the near future, and in the meantime, the school will search hard for a merger partner, preferably one that will not only help it get back on solid financial footing, but enable it to maintain its non-traditional approach — there are no grades here, for example — and decidedly different ways of doing things. Nelson is confident that such a partner can be found — other schools, such as Wheelock College, have forged such partnerships, in its case with Boston University — but time will tell. Meanwhile, the announcement from Hampshire College should serve as a wake-up call, not that anyone in higher education really needed one, that times are, indeed, changing, and that imaginative, proactive steps are needed to secure the future of such institutions. Numbers lie at the heart of this problem — all kinds of numbers, but especially those pertaining to the size of high-school graduating classes. They’ve been falling steadily over the past several years, and at an alarming rate. With fewer students going to college, a survival-of-the-fittest scenario is emerging, and there are high stakes, not only for the colleges involved but the communities in which they reside. Fortunately, for the most part, the ‘eds’ sector locally remains quite strong, and many institutions are faring well, primarily because they are fitter than some others. And by fit, we mean aggressive in efforts to develop new programs and new revenue streams, and also tell their story. In short, they are not sitting on their hands, hoping and believing that times will get better and that what has worked in the past will work in the future. At the risk of greatly oversimplifying things, this is exactly what has happened at Hampshire, and also Mount Ida and other schools. Several schools in this area have been very proactive in finding new ways to attract students and remain vibrant. Bay Path University and the emergence of its cybersecurity programs is a good example (and there are many others there), and American International College’s ambitious expansion of its graduate programs (a strong sources of revenue) is another example. The demographic patterns we’re seeing today are not projected to change anytime soon. High-school graduating classes are going to continue to get smaller, and colleges of all sizes — even this region’s community colleges — must be creative and entrepreneurial in their planning if they intend to not only survive but thrive. If they’re not, there may well be more press conferences like the one at Hampshire College last week.